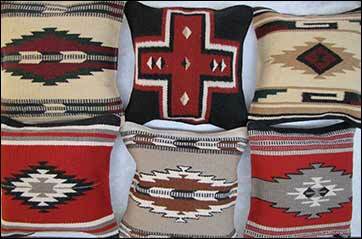 Our pillows are made out of wool and measure 18″ x 18″ with a 13 oz. canvas back and a velcro closure. They are stuffed with a synthetic pillow filling that does not crush down over time. No two patterns are exactly alike, but if you have color preferences let us know and we will do our best to match them for you. View cart “Southwest Design Pillows” has been added to your cart.